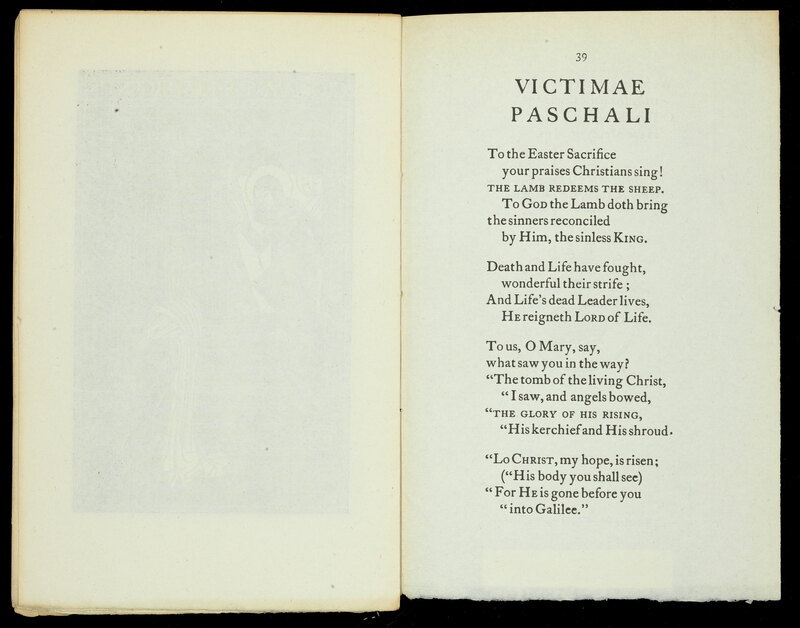 This Thanksgiving we’re highlighting a book of poetry and prose that is part of a group of avant-garde American literary works called the Small Press/Mimeograph Revolution, 1940-1970s collection. 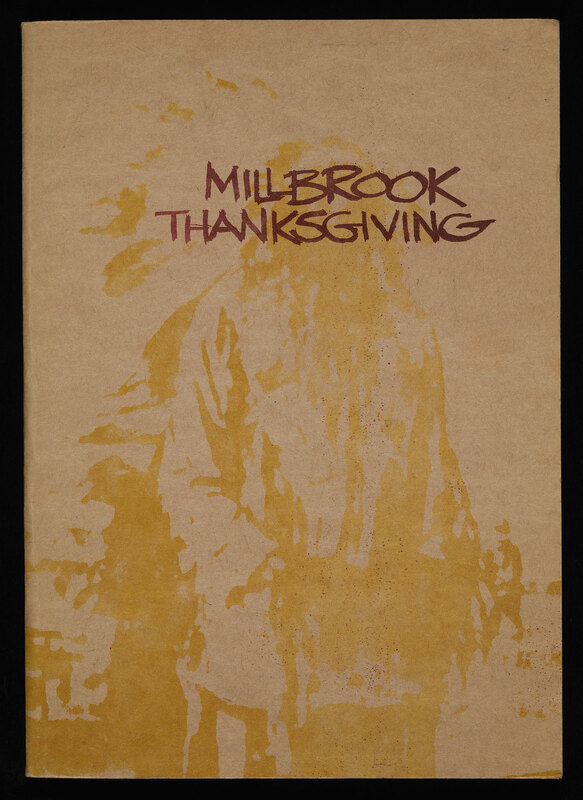 Millbrook Thanksgiving, by poet and writer Walter Schneider (1934-2015), is a panegyric to the psychedelic-fueled community Timothy Leary created in upstate Millbrook, New York from 1963 to 1967. A psychologist interested in the effects of synthetic drugs on human consciousness, Leary settled in Millbrook after being fired from Harvard University for using the substances he was studying (LSD was legal in the US at that time). In the wake of local police harassment that led to Leary’s repeated arrests for minor drug infractions, he moved to California where he crossed paths with Schneider, a PhD student at Berkeley. Schneider’s spirited defense of Leary’s counter culturalism places the book’s content in the cultural vanguard of 1971. 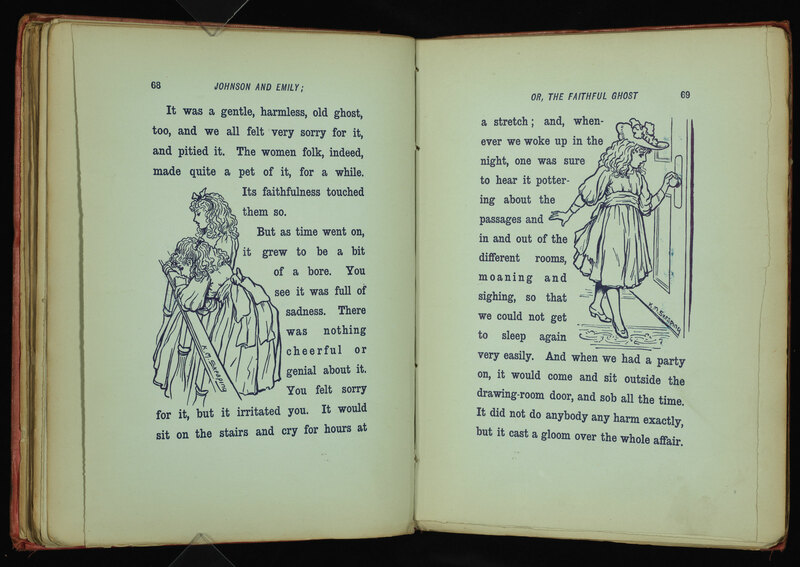 But so does the book’s production. Printed as a small run of just 3,000 copies, its design—from the soft cover, typography, and heavy paper, to its eclectic illustrations—signals the book’s origins outside of mainstream American publishing. 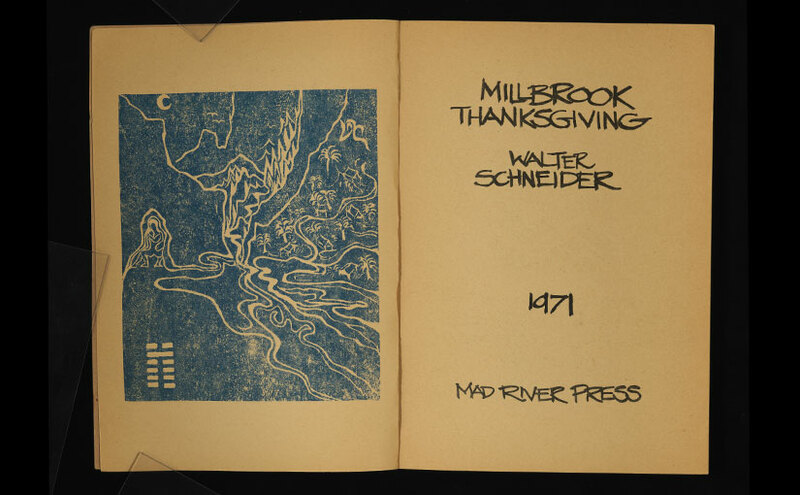 Mad River Press, the small California-based operation that produced Millbrook Thanksgiving, specialized in experimental poetry and creations like Schneider’s. The press released very small runs of poetry chapbooks, which were short (40 pages or less), inexpensively constructed, soft-cover booklets. 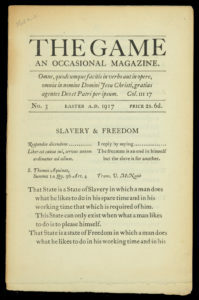 Some were published anonymously and with no identifying publication information, indicating that publisher and author rejected the authority of copyright law. 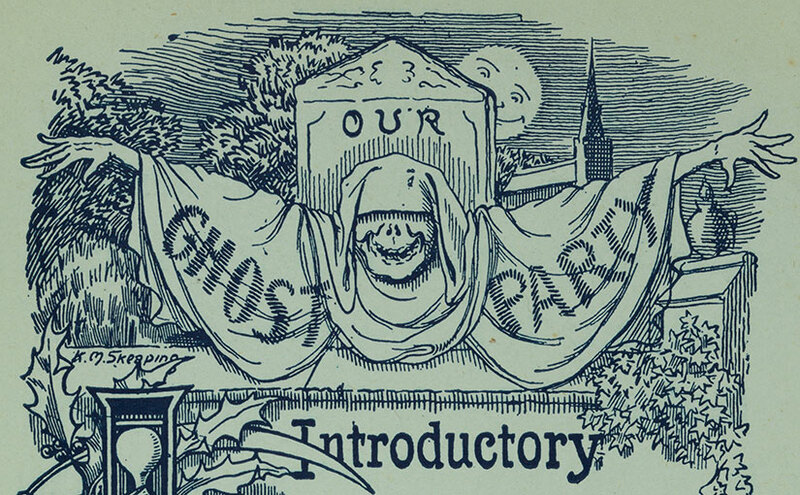 Mad River Press and its authors also placed important visual pieces in their publications. 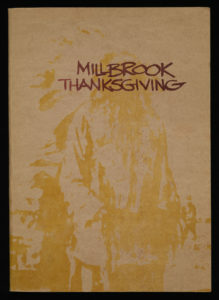 Millbrook Thanksgiving used the first photograph in Robert Frank’s The Americans (published 1958), an extended photo essay that captured Americans in real life. Beat writer Jack Kerouac, who introduced the 1959 edition, noted that “he [Frank] sucked a sad poem right out of America onto film.” His book of photographs remains an important visual text of post-war America. 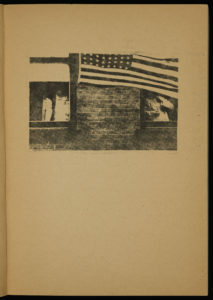 In a chapbook of poetry by Fred Glazer also published in 1971, Mad River Press included an image by the African American painter Louis Delsarte. The library’s Small Press/Mimeograph Revolution, 1940-1970s collection holds more than 350 items. 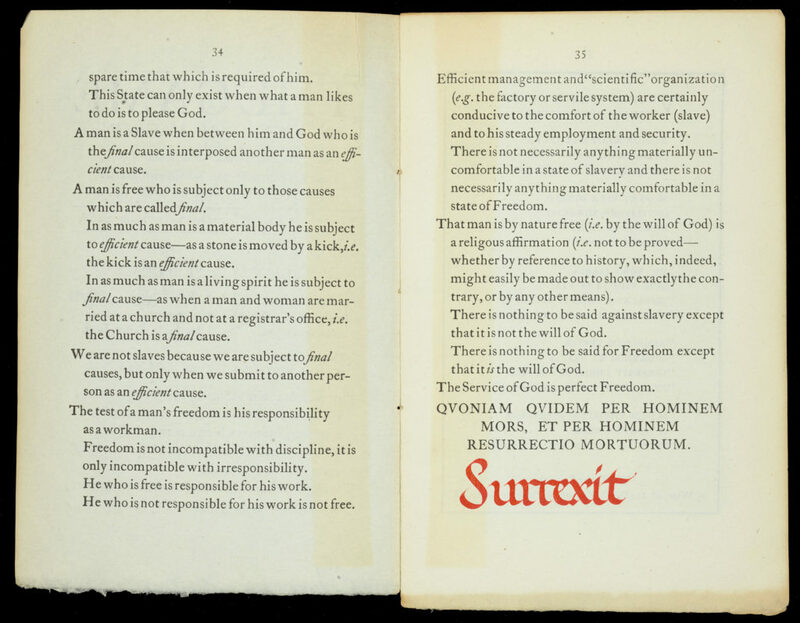 Some, like Millbrook Thanksgiving, were produced by small, experimental presses, while others were created by individuals or small collectives using relatively inexpensive copying technologies like the Ditto machine (remember the smell of those purple ink pages?) or the mimeograph. 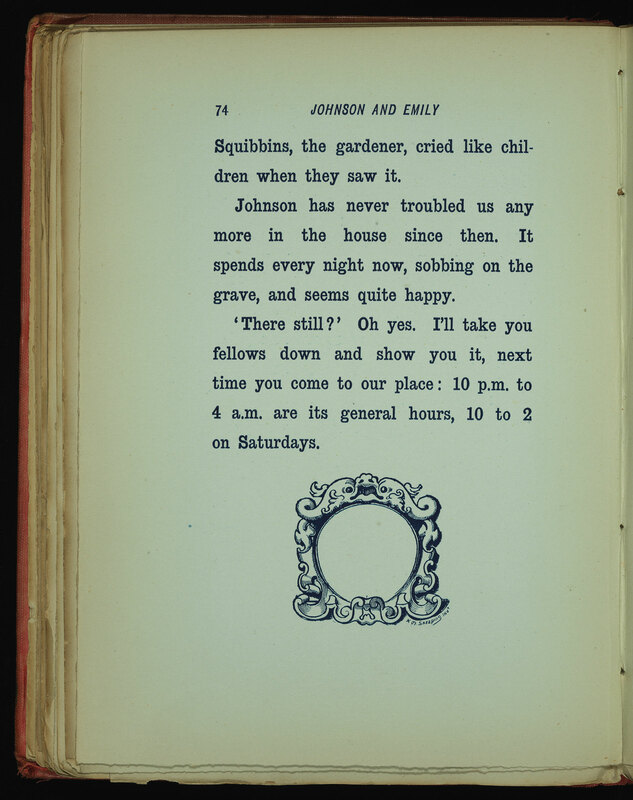 The collection is searchable in the library’s catalog. RBSC will be closed during Notre Dame’s Thanksgiving Break (November 22-25, 2018). We wish you and yours a Happy Thanksgiving! Told after Supper by Jerome K. Jerome is an anthology of short, humorous ghost stories. The copy in Special Collections, shown here, is the first edition, published 1891 by Leadenhall Press in London and illustrated “With 96 or 97 Illustrations” by Kenneth M. Skeaping. 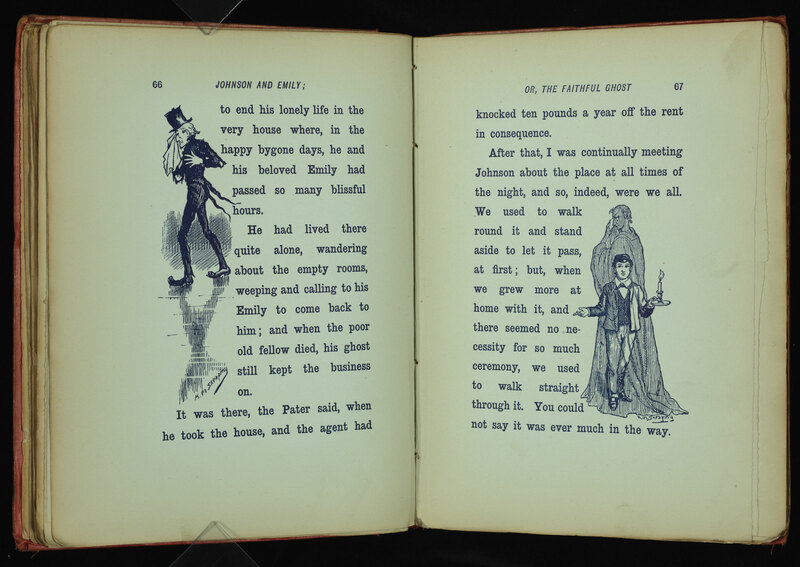 The four primary stories, interspersed with shorter “Interludes,” are told by guests at a Christmas Eve dinner party hosted at the home of the narrator’s uncle. 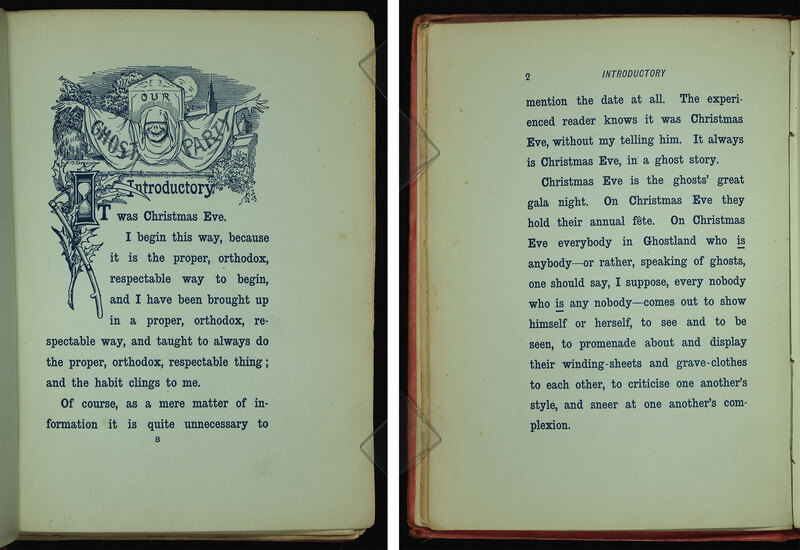 In 19th century England, it was typically not Halloween but Christmas Eve that was considered the time to tell spooky stories. 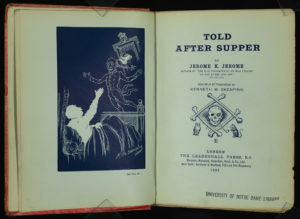 Jerome’s book follows in the tradition of Charles Dickens’ A Christmas Carol (first published in 1843) and other stories written or published by Dickens in the magazines he edited, Household Words and All the Year Round. 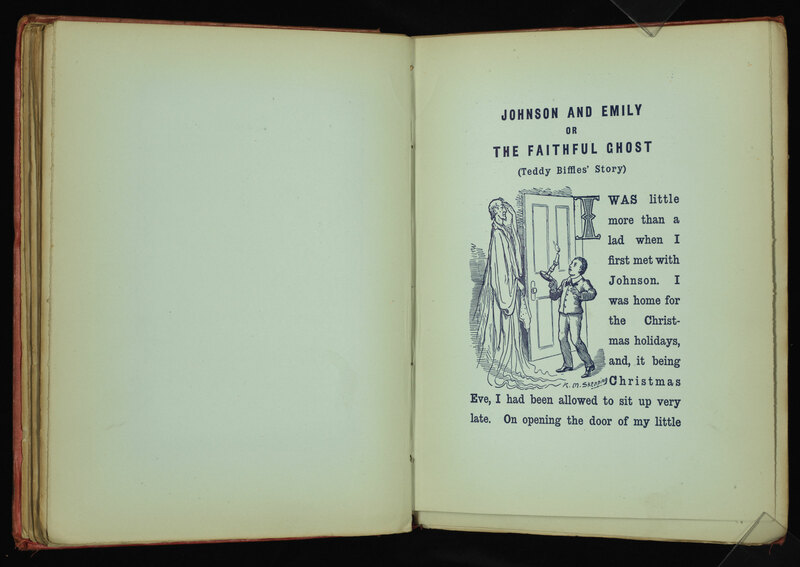 Jerome’s stories are less frightening or moralizing, as the earlier Christmas ghosts tended to be, and more amusing. 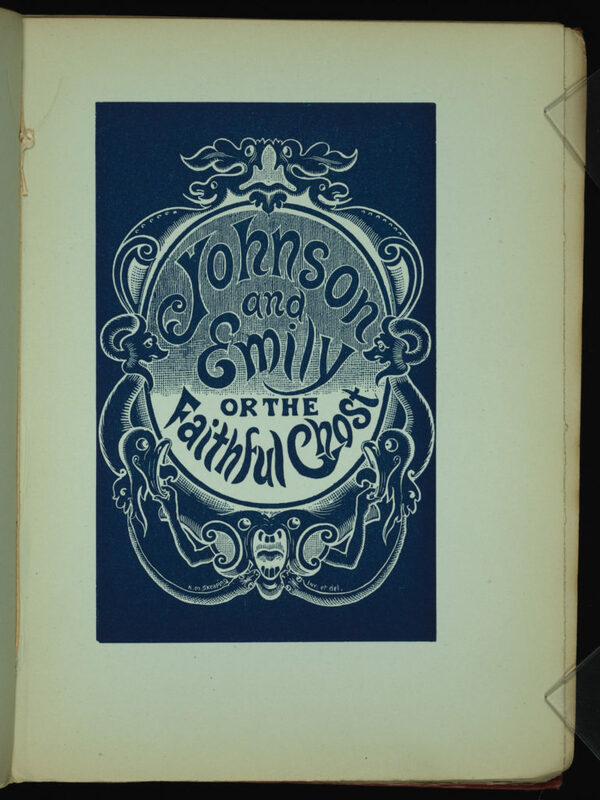 And so, for this year’s Halloween post, we share for your amusement the first story from this volume, “Johnson and Emily; or, the Faithful Ghost”. Friday, September 7 at 1:00pm | Operation Frankenstein: “Illustrated Frankenstein: The 200th Anniversary Edition” by David Plunkert (artist and illustrator). 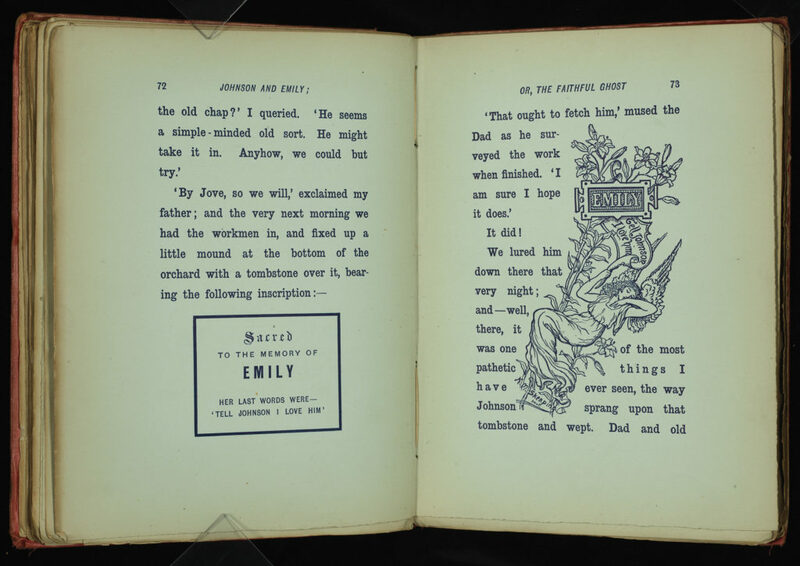 Operation Frankenstein is a semester-long series of interdisciplinary events taking place at the University of Notre Dame to celebrate the bicentennial of Mary Shelley’s novel. Thursday, September 20 at 5:00pm | The Italian Research Seminar: “The Face of Recent Italian Criminal Television: Gomorrah and Beyond” by Dana Renga (Ohio State). Sponsored by Italian Studies at Notre Dame. RBSC is closed Monday, September 3rd, for Labor Day. Wednesday, August 22 at 3:00pm | “The Conservation of Dante’s 1477 La Commedia.” A public talk by Jeff Peachey (Independent Book Conservator, New York City). The conservation treatment of the Hesburgh Libraries’ important copy of Dante’s La Commedia (Venice: Vindelinus de Spira, 1477) will be detailed in this profusely illustrated lecture. Bibliophiles, conservators, librarians, Italian scholars, and anyone curious about the physical structure of books will find this lecture of interest. 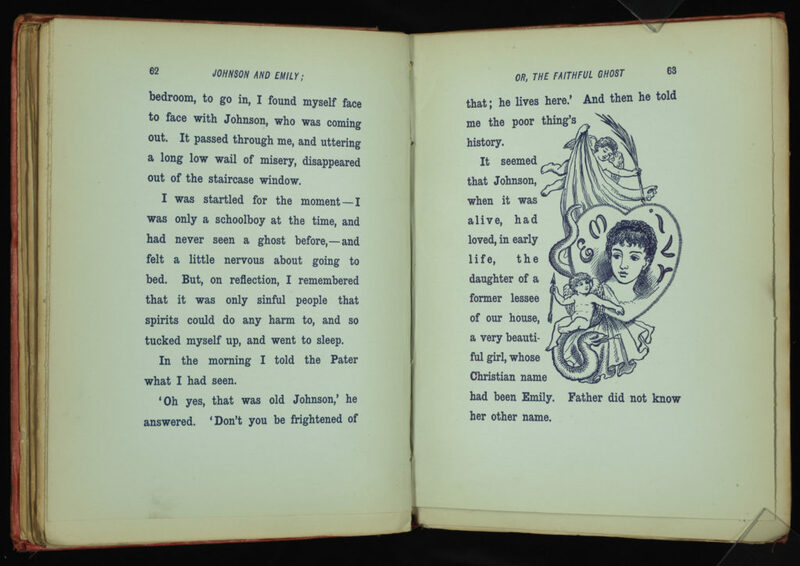 Thursday, August 23 at 5:00pm | The Italian Research Seminar: “The Scene of the Crime: Tombolo On- and Off-Screen” by Charles Leavitt (Notre Dame). Sponsored by Italian Studies at Notre Dame. Friday, September 7 at 1:00pm | Operation Frankenstein: “Illustrated Frankenstein: The 200th Anniversary Edition” by David Plunkert (artist and illustrator for The New Yorker). Operation Frankenstein is a semester-long series of interdisciplinary events taking place at the University of Notre Dame to celebrate the bicentennial of Mary Shelley’s novel. The exhibit In Solzhenitsyn’s Circle: the Writer and his Associates will open on August 20 and run through the end of the semester. The current spotlight exhibits are Frankenstein 200 (August – December 2018) and The Forbes Simulachres: The “Dance of Death” Reimagined (July – August 2018). RBSC will be closed Monday, September 3rd, for Labor Day. To honor all who died while serving in the United States Armed Forces. 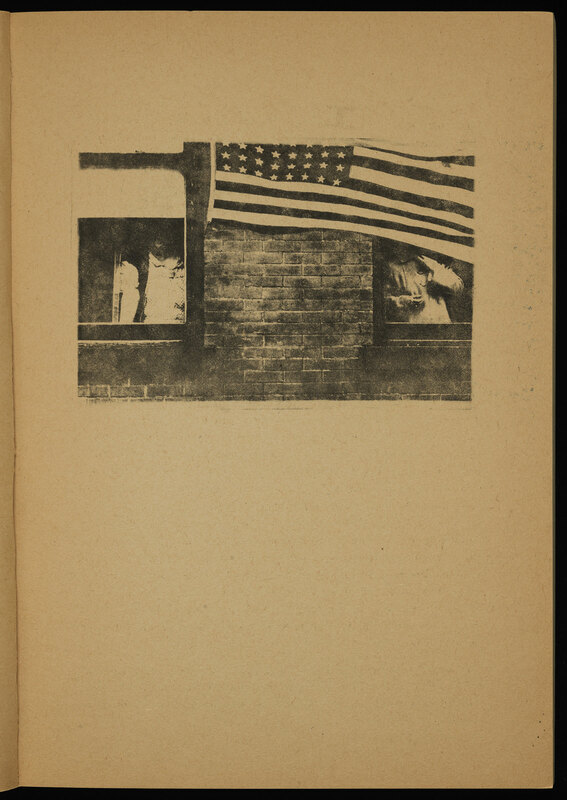 Originally, Memorial Day was celebrated as Decoration Day. Henry Wadsworth Longfellow (1807-82) was but five years old when he witnessed the War of 1812 devastate his hometown. This event had a long-lasting impact on him. Wordsworth would go on to Bowdoin College, graduating along with Nathaniel Hawthorne in 1825 before traveling through Europe, where he gained mastery over seven languages. On his return to the US, he taught languages first at Bowdoin and later at Harvard, and also spent much time writing textbooks and essays on languages, particularly French, Italian, and Spanish. 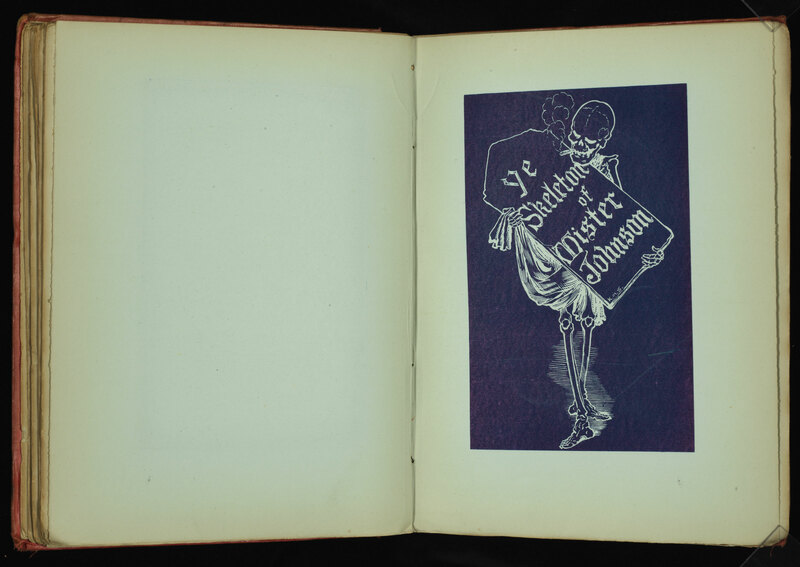 While at Harvard, Longfellow’s literary career took off. 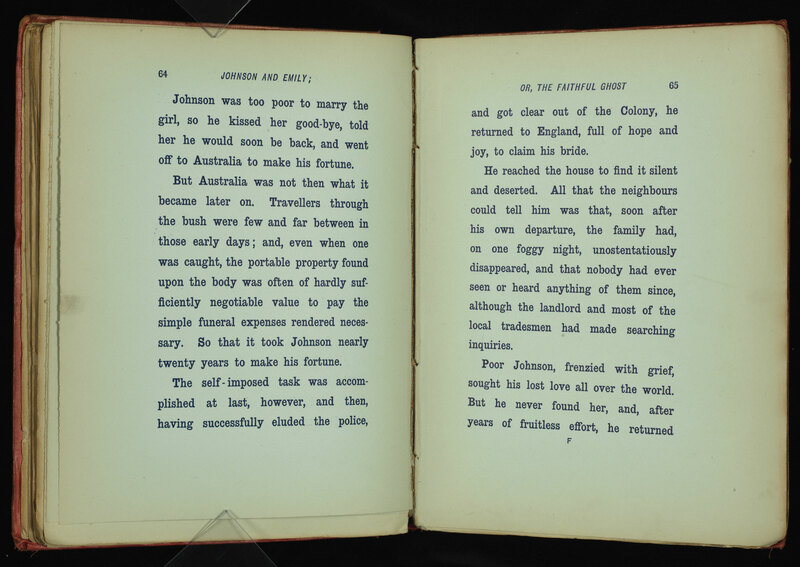 He travelled to Europe twice more before resigning from Harvard in 1854 to devote his full attention to writing. 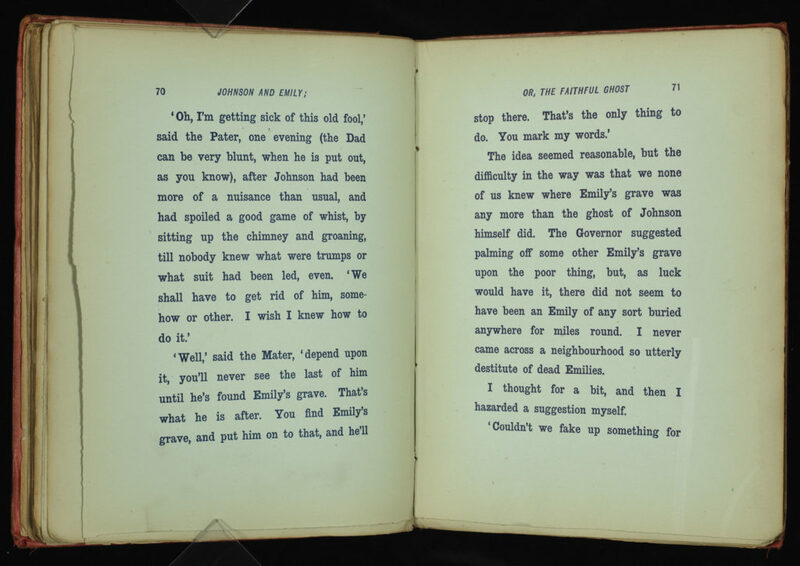 Less than a decade later—in 1861—not only did his beloved wife, Fanny, die but the Civil War broke out and his son, fighting for the Union, was wounded. The invalid had to be escorted home by his father and brother. 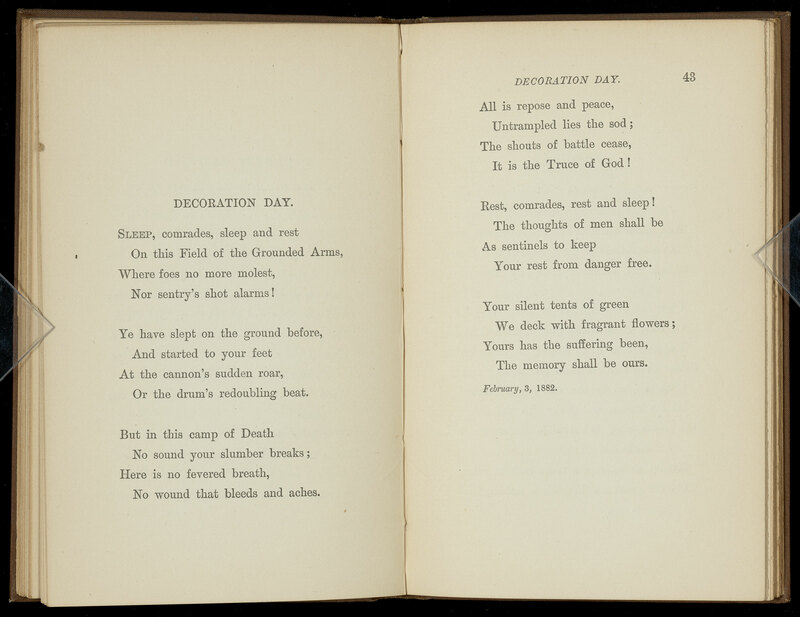 To cope with these tragedies, Longfellow immersed himself in his literary endeavors including a full translation of Dante’s Divine Comedy (completed in 1864). 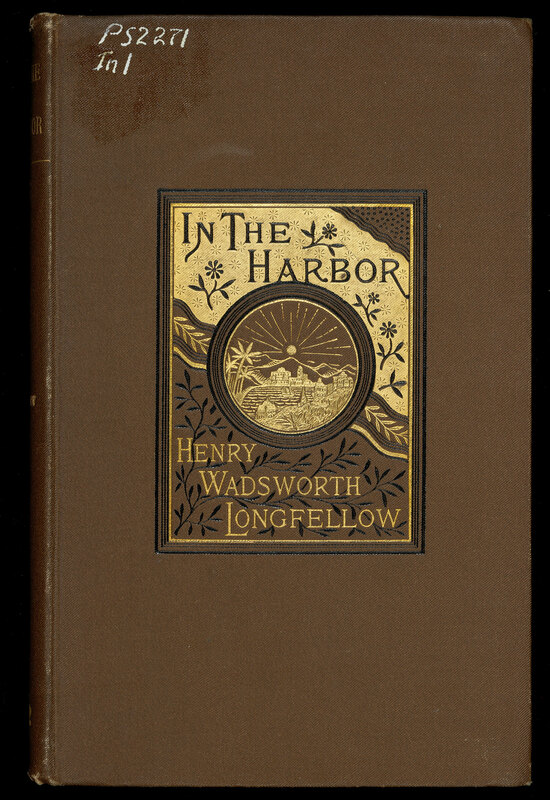 Against memories of the War of 1812, the Civil War, and the traumatic loss of a wife and the injury of a son, Longfellow continued to write. 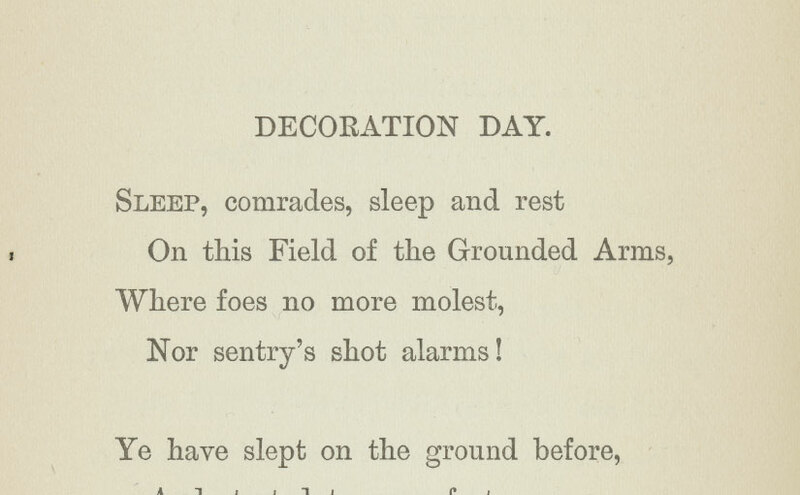 In some of his last pieces, including “Decoration Day,” one cannot help but notice Longfellow’s solemnity and poignancy. During June and July the blog will shift to a summer posting schedule, with posts every other Monday rather than every week. We will resume weekly publication on August 13th. 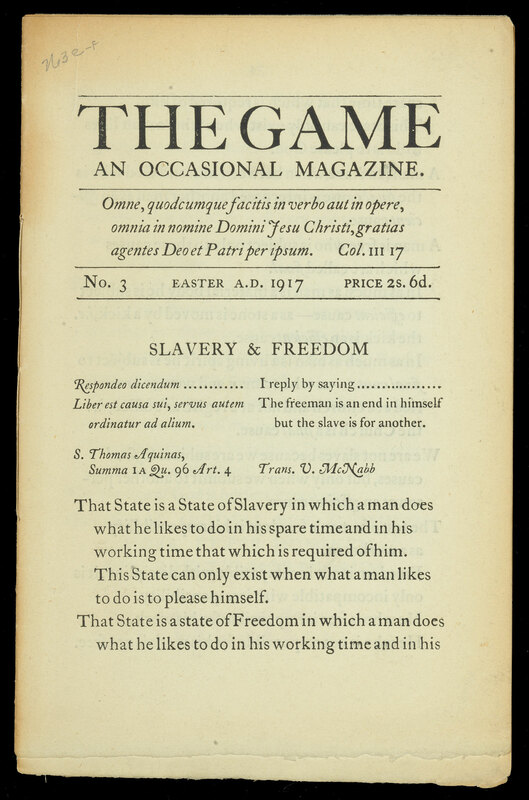 The Game: An Occasional Magazine was first issued in 1914 by Eric Gill, Edward Johnston, and Hilary Pepler. 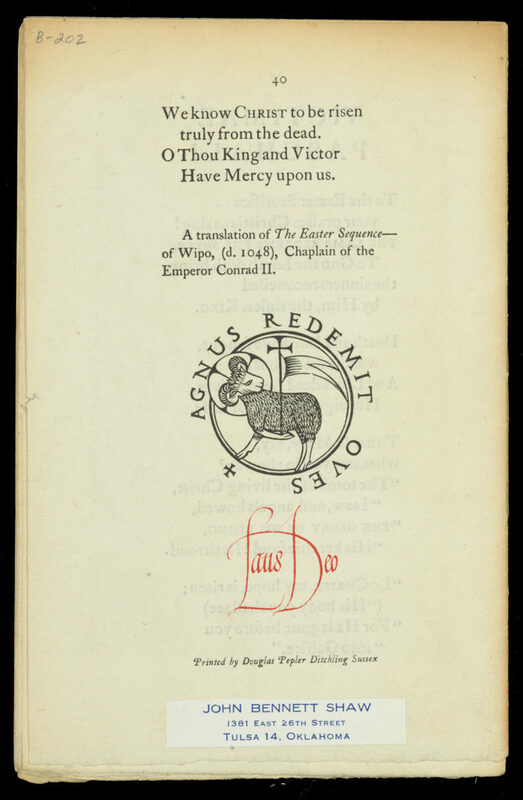 This publication became the main forum for members of the Guild of St. Joseph and St. Dominic. 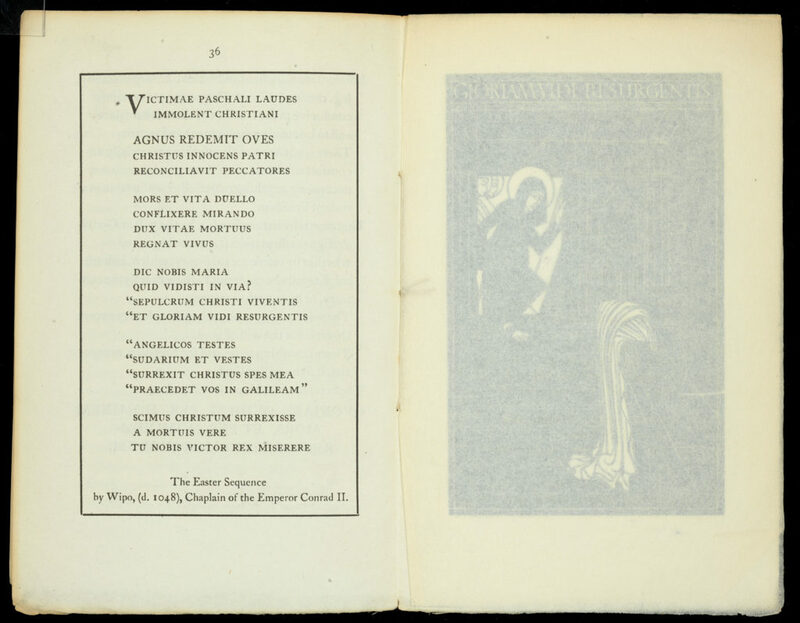 The Easter 1917 issue featured here is from the Eric Gill Collection. 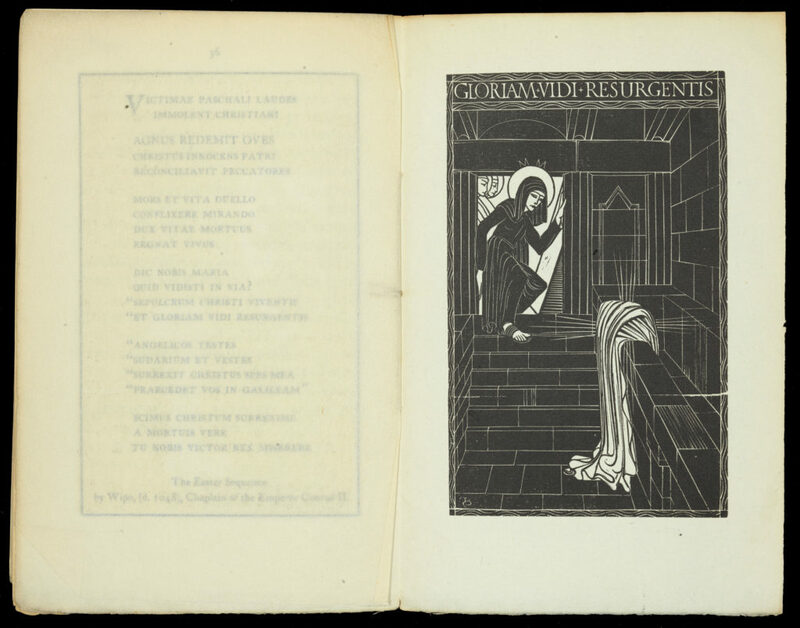 It contains Eric Gill’s woodblock prints, “The Resurrection” and “Paschal Lamb” accompanied by text from The Easter Sequence by Wipo (d. 1048). 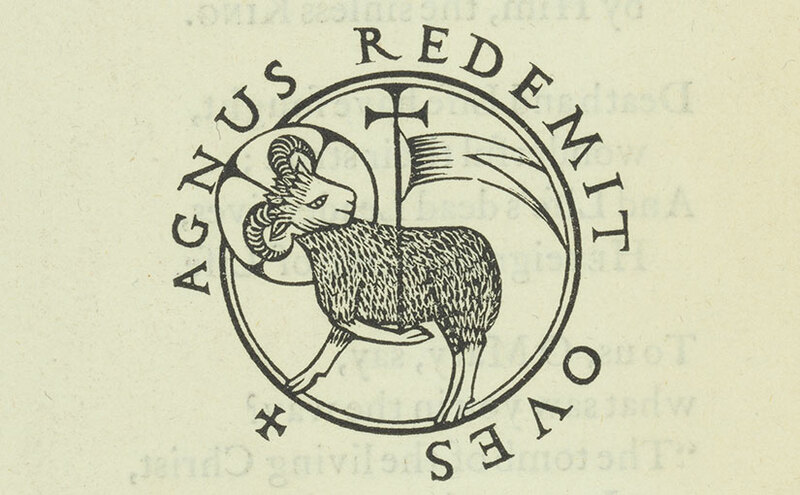 Rare Books and Special Collections will be closed in observance of Good Friday on March 30. 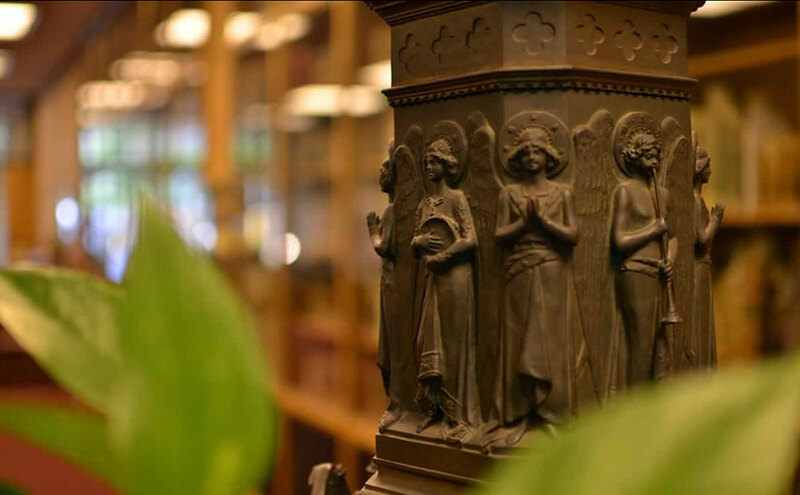 We will reopen at 9am on Monday, April 2, 2018.
at the University of Notre Dame.